Offering you a complete choice of products which include oil packing machine, double head water pouch packing machine, liquid pouch packing machine, mrichi saalan and raatha pouch packing pouch packing machine, soft drink pouch packing machine and liquor pouch packing machine. We put forth an extensive range of Oil Packing Machine, which finds application in oil industry. Robust in construction, our range is appreciated by clients for accurate performance, perfect finishing and corrosion resistance. Oil Pouch Packing Machine gives an average out put of 1000 pouches per hour and has overall dimension of 2500 (H), 750 (W) x 700 (D). To meet the diversified requirements of our prestigious clients, we are involved in offering Water Pouch Packing Machine. The offered packing machines are developed using superior quality material and latest techniques in conformity with set industry standards. We are giving these packing machines from us on number of specifications as per customer’s requirements. Furthermore, these packing machines are properly inspected on numerous quality parameters for assuring its excellence at customer’s end. 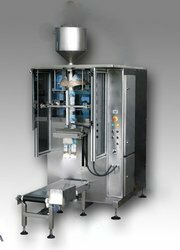 Liquid pouch packaging machines are machines used in various packaging industries for packing different types of materials in varying pouch sizes. Our company is one of the leading manufacturers and suppliers of liquid pouch packaging machine in India. This machine offered by us is well manufactured using high grade raw materials and efficient techniques based on the industrial standards. Roll Width 225 or as per spec. Our company is one of the leading manufacturers and suppliers of Soft Drink Packing Machine in India. 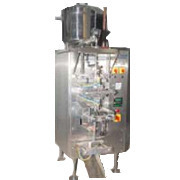 Packaging industries located in various parts of India are looking for quality liquid packing machines that are well designed with efficient features, with the help of our highly experienced professionals and manufacturing techniques we understand the diversified requirements of our clients and thus manufacture this soft drink packing machine in customized ranges. This soft drink packing machine offered by has complete stainless steel construction and is operated electronically. With different packaging styles and specifications this packing machine is widely appreciated in various food packaging industries. This soft drink packing machine offered by us has different filling capacities ranging from 50ml to 1000ml. and the packaging styles like pouches, packets, bottles and much more can differ based on the application level. 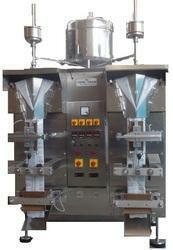 with high expertise professionals we ensure to deliver this soft drink packing machine in cost effective prices. Automatic and electrical controlled operations. 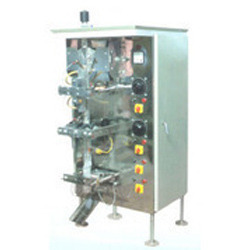 Our company is one of the leading manufacturers and suppliers of Liquor Packing Machine in India. 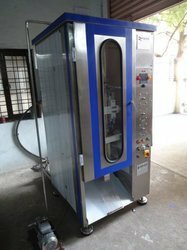 We manufacture these machines using high grade raw materials like stainless steel, aluminum etc based on the application level to ensure high quality. Well designed in vertical forms this liquor packaging machine can pack different types of liquids in specified quantities. The liquor is well processed under hygienic conditions and a quantized flow is maintained for ensuring safe packaging. The liquor packing machine offered by us is completely automatic and accurate filling and sealing of liquor in pouches is completely ensured. Well equipped with efficient features our liquor packing machine consumes less power and hence can reduces the running cost of the machine. The machine is tested on various parameters to ensure that the product delivered by us is of high quality. The machine can pack liquor in different quantities ranging from 50ml, 100ml etc based on the requirements of our clients. 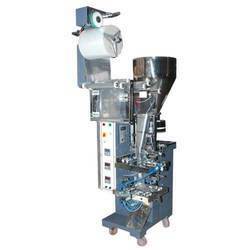 With highly experienced work man we pay complete attention in on time delivery of this liquor pouch packing machine. 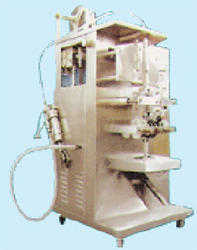 Customers can also avail this liquor packing machine from us in market leading prices. Vertical style and quality design. Automatic functions for controlling the flow. The machine requires no air compressor. Owing to our team of efficient professionals, we have been able to manufacture Form Fill Seal Machine. These are designed using high grade raw material such as stainless steel, aluminum, gun metal and mild steel brass to ensure long functional life and fine performance. Our range is widely used in variety of applications and can be customized as per the client’s specifications. Leveraging upon our vast industry experience, we are offering a quality-assured range of Mineral Water Pouch Packing Machine. Known for its low power consumption and durability, these packing machines are useful for various industrial and commercial purposes. Our packing machines are accessible in various specifications in accordance with the requirements of customers. We develop this packing machine using top notch material & leading technology. In order to attain the maximum satisfaction of our esteemed clients, we are engaged in manufacturing, distributing and supplying the finest quality Automatic Powder Pouch Packing Machine. The provided pouch packing machine has metering adjust device enables loss reducing, volume of the packaging changing anytime and improve productivity. Embedded sealing , enhanced structure of heat sealing intelligent temperature controller and excellent heat balance make all kinds of packaging materials possible with good performance, low noise, clear cutting pattern and strong seal ability. Owing to our rich industrial experience and knowledge, we are engaged in presenting Milk Pouch Packing Machines. The offered packing machine is developed expertly as per the prevailing market norms using high quality material and contemporary techniques. 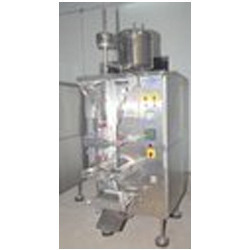 This packing machine is used in various food packaging sectors for packing different types of liquids. Offered packing machine is provided in varied of specifications to choose from. Liquid pouch packaging machines are widely used in various food packaging sectors for packing different types of liquids like milk, soft drinks, juices, butter milk etc. Our company has engaged itself in manufacturing and supplying a wide range of liquid packaging machines like butter milk pouch packing machine, mineral water packing machine, soft drink packing machine and many more based on different application levels. This butter milk pouch packing machine offered by us is manufactured using high quality raw materials to ensure high durability and longer service life. 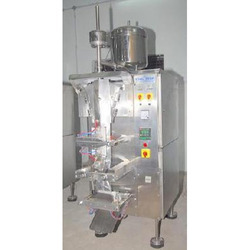 The butter milk pouch packing machine comprises of vertical filling system that can be effective for filling the pouches in different quantities as per the settings. The machine runs by electricity and does not consume much power thus cost of maintenance is highly reduced. Our butter milk pouch packing machine is designed with different sealing options based on which the pouches have to be packed. Automatic filling of the liquid and flow of packing material is done such that no spillage occurs. We offer these butter milk pouch packing machine in standard and in customized ranges, customers can avail these butter milk pouch packing machines in cost effective prices. We are counted among the leading manufacturer, wholesaler, retailer, exporter and supplier of an extensive array of Automatic Ice Candy Machine. 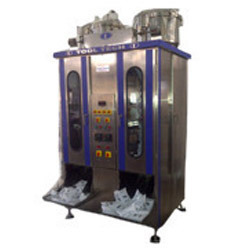 The offered candy machine is developed expertly as per the prevailing market norms using high quality material and contemporary techniques. 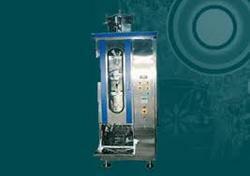 This candy machine is inspected on diverse parameters in order to supply flawless range. Offered candy machine is provided in varied of specifications to choose from. 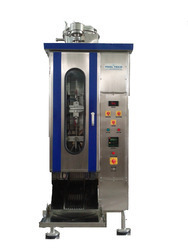 Looking for Pouch Packing Machines ?